How do firefighters in Australia use web maps to prevent and fight bushfires? How does a seed company use the analytical power of web GIS to help farmers feed the world? How is GIS used to manage an airport and a region's water resources? Representatives from four organizations walk you through how they apply geography to making critical decisions. Read the article. A team from Beck's Hybrids demonstrates the GIS-powered FARMserver, which provides farmers with information about farms, fields, weather, and markets. 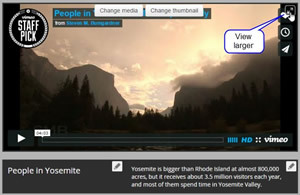 Find out how to add Vimeo videos to a Story Map Tour, the popular story map app template for creating sequential, place-based narratives. Read the tip. The city of Westminster, Colorado, creates web maps to inform citizens about a variety of issues and events, including comprehensive land-use plans, dog parks, and art walks. Read the article. Walgreens and other companies reveal how GIS is changing the way they do business. Read the article. Swoop in and take a close look at how Hartsfield-Jackson Atlanta International Airport uses web GIS to manage operations and maintenance 24/7. Read the article. 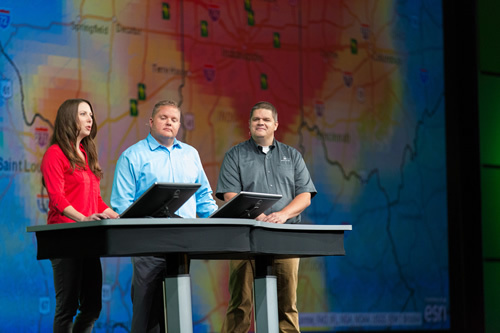 Esri utilities solution director Bill Meehan lists seven ways to bring your GIS up to date. The first question to ask: Is my GIS doing what I want it to do? Read the article. Esri will host three, one-hour webinars to show water utilities how they can use ArcGIS to increase water conservation and reduce water loss. The webinars will be September 24, October 22, and November 19. Read the blog and sign up. Find out how your organization and citizen scientists can put easy-to-use GIS apps to work for crowdsourcing projects at the Citizens + Science = Innovative Insights webinar at 10:00 a.m. (PDT) September 23, 2015. Register today. See where fires are burning across the United States as drought conditions persist in the West.. Explore the map. See eight great examples of the types of 3D web scenes of cities, buildings, coral reefs, and even bike routes that you can build using Esri technology. Read the blog. Find out what you can do with Collector for ArcGIS and learn how to use the app to gather data in the field. Watch the one-hour technical session. Learn to create and share compelling 3D maps and scenes using Esri technology. Get a sneak preview of the free ArcGIS Earth app too. Attend the September 24 live training seminar. You asked for the new capabilities and enhancements, and Esri packed them into ArcGIS Pro 1.1. Read the blog. Learn to make a map that routes four restaurant inspectors to 36 eating establishments in a day. The goal: Maximize their time at the restaurants and minimize their time on the road. Take the Learn ArcGIS lesson. Help to shape the next generation of GIS tools for ocean science at the Esri Ocean GIS Forum, November 4-6, 2015. Learn the value of using GIS in fields such as ocean science research and fisheries management. Register to attend. The new Trimble R1 GNSS receiver, offered by Esri, gives you the ability to collect highly accurate location data with your iOS or Android device running Collector for ArcGIS. Order today. Ten years after Hurricane Katrina displaced more than one million New Orleans area residents, these Esri maps show the neighborhoods that were flooded, the population shifts, and the areas restored. Read the article on Smithsonian.com. From collecting data about damaged trees in Washington, DC, to broken light poles in Sweden, there are countless ways to use Collector for ArcGIS. Read the article.